Circles concierge services, managed by our subsidiary Circles, enable us to deliver a range of on site services to improve the quality of life of its occupants. From day to day services, errand running to organization of childcare solutions, our concierges addresses all the personal needs of the occupants. 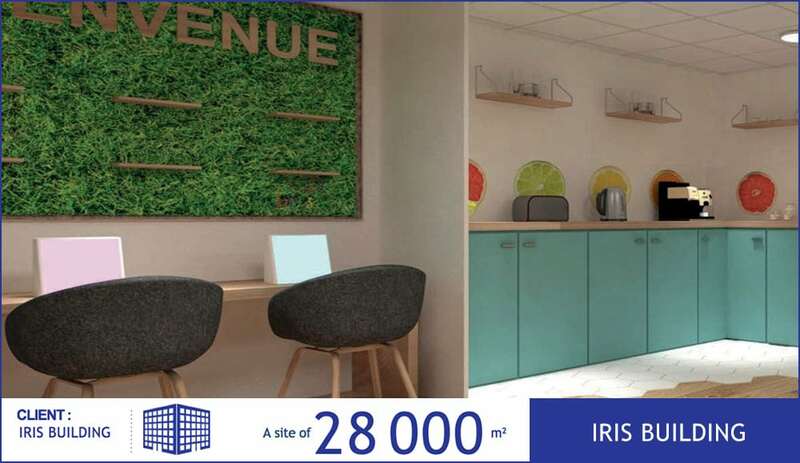 For the IRIS building, its occupants can enjoy a fitness club with collective courses, well-being services (hairdressing, beauty treatments, massages, manucure and relaxation spaces), and concierge services (dry cleaning, shoe repair, sawing, gift shopping …). Circles also found innovative partners with electric biles and cars for the occupants usage. The community manager helps animate the occupants everyday life by proposing events and animations to boost Quality of Life : Foosball tournements, workshops, pop up stores, animations – with the objective to engage communities! For any request, the community manager is your dedicated assistant : he finds solutions for any kind of request. From administrative requests, home services requests, car maintenance, travels ….but also daily servcies such as; dry cleaning, shoe repair, meeting room reservations, parcel reception, fitness classes, bikes or cars reservations. With 50-year experience in Quality of Life services, Sodexo through its concierge business Circles, imposed himself as the ideal partner to guarantee to occupants the best balance between private and profesional life sot hey can concentrate on their day to day profesional responsibilities. Above all, by understanding the stakes of a 30 000m2 building, the Circles team has propose a fun concept by decling a logo for the building with geolocalisation pictograms for the various proposed services. The objective : everyone must find its way and identify quickly the services which are part of the proposed service offer. An innovative idea which is part of the key success factors. Make our offer evolve is to listen to our clients’ employees needs and demands and count on our concierge knowhow to deliver personalized services.